Super Bowl 53 is to be played in Atlanta, Georgia on the 4th February 2019, this will be the third time Atlanta, Georgia has hosted the Super Bowl. This year it will be played at the Atlanta Falcons (National Football League) teams new home ground, “Mercedes-Benz Stadium”, which replaced the Falcons’ old stadium the “Georgia Dome”. The stadium has a capacity of 71,000 which can be expanded to 75,000; the stadium is multi purpose, being home to the Atlanta Falcons, Atlanta United FC; the size of the surface for American Football is 109.7 metres x 48.8 metres. 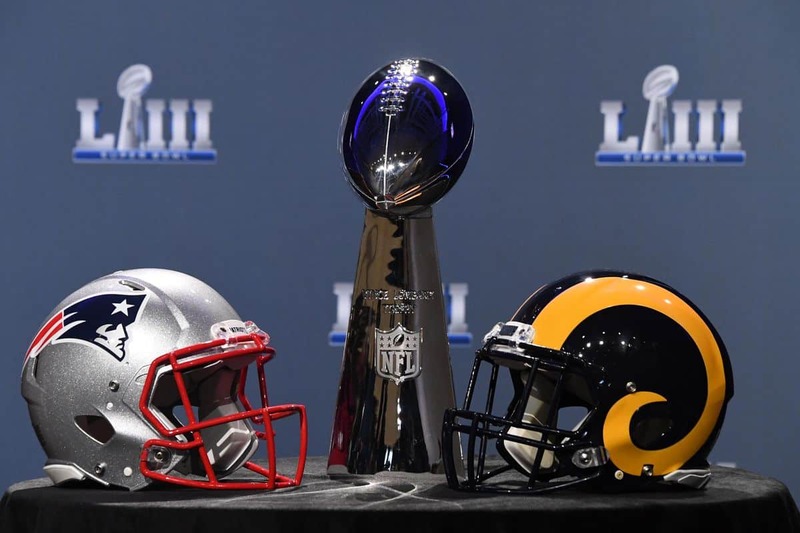 2019 National Football League final is between the New England (NE) Patriots and the Los Angeles (LA) Rams. The Rams franchise began in 1936 as the Cleveland Rams in the short lived American Football League. In 1937 they moved to the National Football League (NFL) and they moved to Los Angeles in 1946, they moved again in 1994 to St Louis. The Rams moved back to Los Angeles in 2016, they are using the Los Angeles Memorial Coliseum for home games, which was their original home ground back in 1946, but they will eventually move to a new stadium at Hollywood Park when completed. The Rams first of three Super Bowl appearances happened in 1979, their opponent in this match was the defending Champions, Pittsburgh Steelers, who won 31 to19. The Rams next Super Bowl appearance was in 2000 when they played the Tennessee Titans, at Georgia Dome, Atlanta, Georgia, the Rams won 23 to 16. The Rams played in the Super Bowl the following year against the NE Patriots, the Patriots won their first Super Bowl championship, 20 to 17. The Rams were very dominant during the period 1999 to 2004, but they only won one Super Bowl championship. After the Rams lost in the playoff match last season, they decided to load up in the off season with quality players in defence and offense, to give themselves the best chance to make Super Bowl 53. They have a young coach and a young quarterback (Jared Goff) in his third season, but is improving all the time, and with Todd Gurley (offensive player of the year in 2017), expected to have large numbers in the regular season. Most experts think that the Rams have the best roster and best coach in their division. The NE Patriots have been the most dominant team in the American Football Conference (AFC), since 2009, where they have won nine AFC East division titles. The Patriots are based in Boston, and play their home games at Gillette Stadium, which is located in the town of Foxborough, Massachusetts, which is 34 kilometres southwest of Boston. The Patriots have won five Super Bowl championships; they have made eleven Super Bowl’s, the most of any franchise team and nine of these have been since 2000, when “head coach” Bill Belichick and quarterback Tom Brady arrived at the Patriots. This is the Patriot’s third Super Bowl in a row, after they lost last season to the Philadelphia Eagles. Will the Rams who were lucky to make the Super Bowl, after their controversial conference win against New Orleans Saints, be able to handle the pressure of possibly the greatest quarterback in NFL history, Tom Brady and the wiles of the Patriots coach. About the only thing that can be said is, that it should be a close game, the largest winning margin in the Super Bowl involving the Patriots is eight points.